My vegan 'wife' Emma came to stay a few days ago and literally cooked, cleaned and entertained Ruby (doggy) while I was at work. I wish she could move in forever, because coming home to a vegan meal each night is the best thing ever (take note Mr Hef). 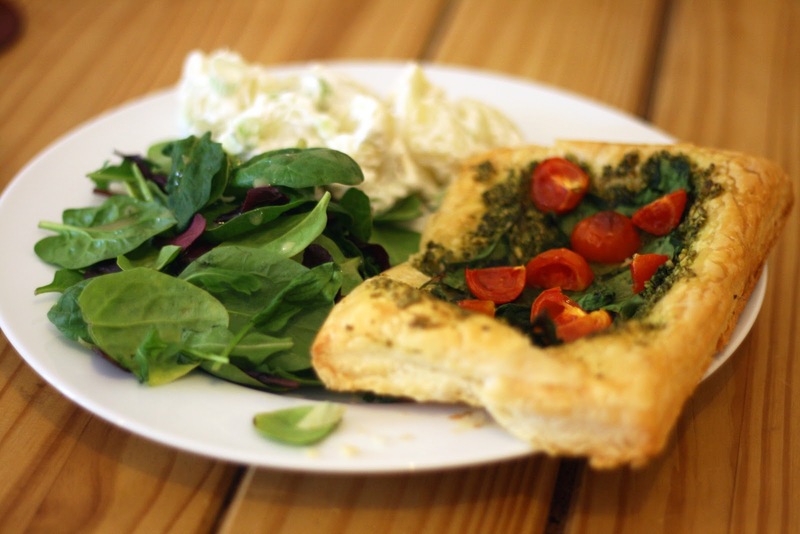 On the first night she stayed I got home, had a bath (lush of course) and by the time I was out I was presented with this yummy pesto, spinach and tomato tart with vegan potato salad. The potato salad is super quick and easy, just boil some new potatoes, let them cool, cover in vegan mayo and spring onions and eat! The tart is just as simple, so if you're in a rush this is a great one to whip up. Put the basil, chopped nuts and oil into a food processor and throughly blitz, keep adding oil until it becomes a lovely pestoy consistency and season. Unroll your pastry, cut into 4 equal rectangles and transfer on to a tray lined with greaseproof paper. Smother your pastry with your vegan pesto and top with spinach and chopped tomatoes. Pop in to the oven for 15-20 minutes, until its puffed up and golden brown. Serve up with your potato salad and enjoy!